The Millennium Bridge. Photo by Richard Watkins LRPS. 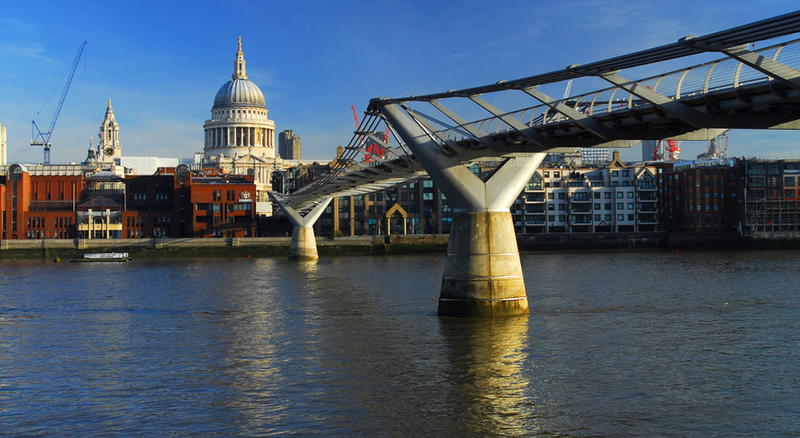 It's one of the most striking of the Thames bridges, and definitely one of our favourites. 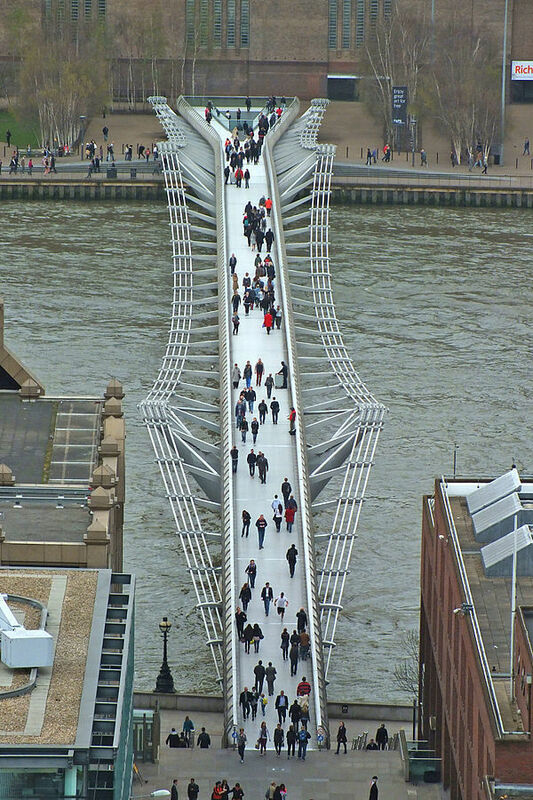 Here's everything you need to know about the Millennium Bridge. 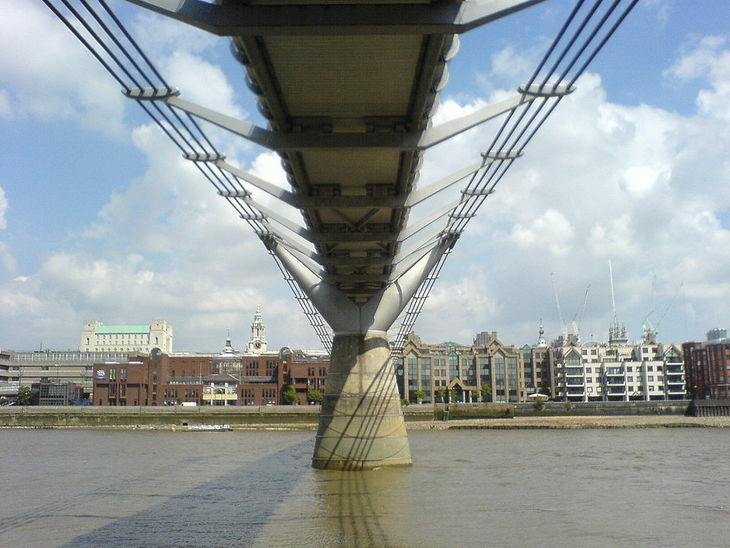 The Millennium Bridge was the result of a 1996 competition held by Southwark Council in conjunction with the Financial Times and the Royal Institute of British Architects. The call, for a new bridge across the Thames, was won by the 'blade of light' design envisioned by Arup (engineers), Foster and Partners (architects) and Sir Anthony Caro (sculptor). The bridge as seen from St Paul's Cathedral. Photo via wikicommons. The Millennium Bridge was the first new bridge to be built over the Thames in London for more than 100 years. Usually, all new bridges across the Thames require an Act of Parliament to be passed. 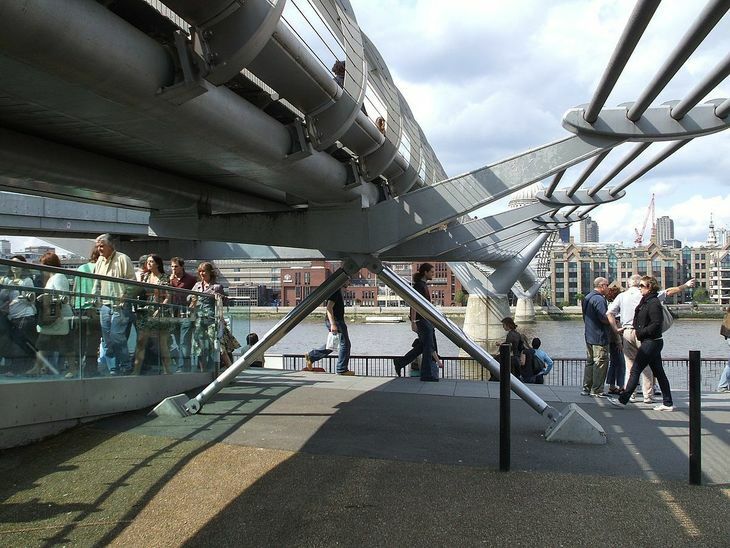 For the Millennium Bridge, that need was avoided: instead the Port of London Authority granted a licence for the structure, obtaining planning permissions from the City of London and London Borough of Southwark. The bridge has two river piers and is made of three main sections of 81 metres (266ft), 144 metres (472ft) and 108 metres (354ft) (north to south) with a total structure length of 325 metres (1,066ft). Underneath the Millennium Bridge. Photo via wikicommons. The aluminium deck is four metres (13ft) wide. The Millennium Bridge officially opened by the Queen on 10 June 2000, two months later than originally planned. Two days later, on 12 June 2000, it was closed again. It then reopened - this time for good - on 27 February 2002. Its official title is the London Millennium Footbridge. But no-one calls it that. Instead, it'll probably always be called the Wobbly Bridge. Built using 'lateral suspension', an engineering innovation allowing suspension bridges to be built without tall supporting columns, the Thames' newest crossing was hit by a phenomenon called Synchronous Lateral Excitation when loads of people flooded over its shiny new deck. Around 80,000 people crossed the bridge on its opening day, with around 2,000 on the bridge at any one time. Those on the southern and central spans felt the bridge begin to sway and twist in regular oscillations. Feeling unsteady, the pedestrians altered their gait to the same lateral rhythm as the bridge. The adjusted footsteps just magnified the motion: the more it happened, the more people responded to the movement; and the worse it got. While there was no chance that the bridge actually would fall down, engineers felt that the wobble needed to be stopped. In the end, the problem was fixed with two different types of damper: viscous dampers (like car shock absorbers); and tuned mass dampers: a large mass stiffened by springs, sometimes used in buildings in earthquake zones. The tuned mass dampers absorb vertical movement. Photo via wikicommons. The Millennium Bridge is far from being London's first wobbly bridge: the 1873 Albert Bridge is nicknamed the Trembling Lady, with a notice that troops must 'break step' when crossing to prevent these vibrations from becoming too pronounced. Constructing the Millennium Bridge is said to have cost £18.2 million; £2.2 million over budget. It was primarily paid for by the Millennium Commission and the London Bridge Trust. 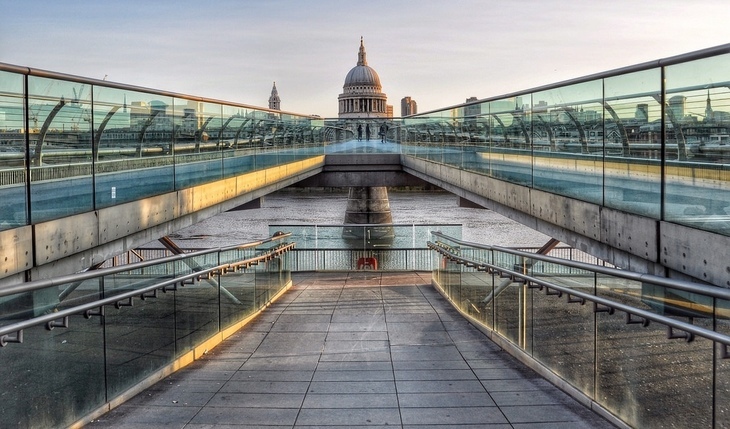 The Millennium Bridge is perfectly aligned to create a terminating vista of the south facade of St Paul's Cathedral. When you walk across, the cathedral is beautifully framed by the bridge supports. In 2007, the bridge was closed during the unusually violent storm, Kyrill. It was thought that there was a risk of pedestrians being blown off the bridge. That's some storm. 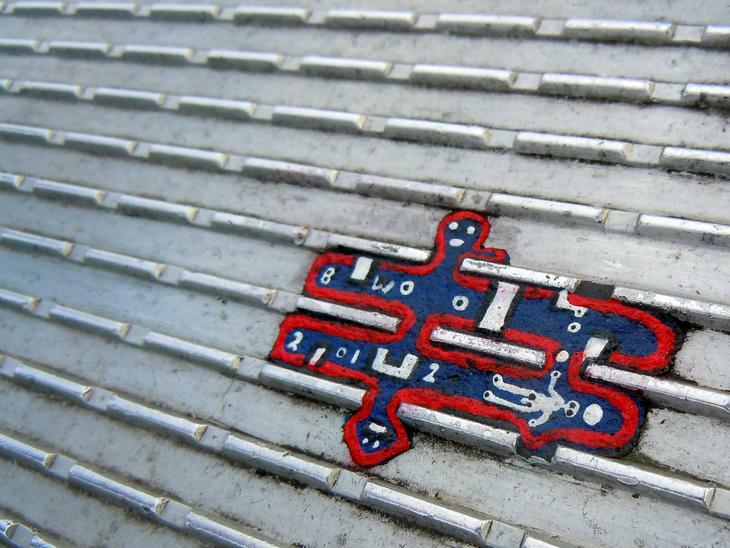 There are around 400 tiny works of art on the Millennium Bridge. The work of street artist The Chewing Gum Man (real name, Ben Wilson), these minuscule masterpieces are painted onto a unique canvas: the chewing gum dropped by other people. Wilson paints tiny scenes, shapes and figures on the bits of trodden-down gum, using layers of acrylic paint to build up brightly coloured, jewel-like blobs on the urban landscape. Ahh, the millennium. It was a boom time for bridge building, and London's Millennium Bridge is one of several Y2K (as we used to call it) projects. There's are six other Millennium Bridges in the UK alone: in Gateshead, Lancaster, Glasgow, Salford, Stockton-on-Tees, and York — and there are plenty of others around the world. 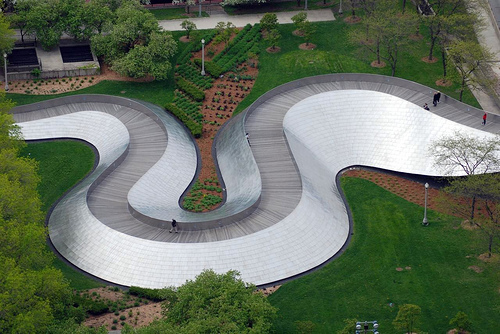 The BP Pedestrian Bridge by Frank Gehry, in Chicago, built for the Millennium. Despite being less than 20 years old, the bridge has already appeared in various films and music videos. As well as featuring in films Guardians of the Galaxy, Run Fat Boy Run and Namaste London, it also appears in the video to the Olly Murs song Heart on My Sleeve.